This southern live oak leans radically over the Suwannee River, seeming to defy the laws of gravity. Its secret? Super-tough wood and a strong deep tap root that develops an extensive system of side roots with age. 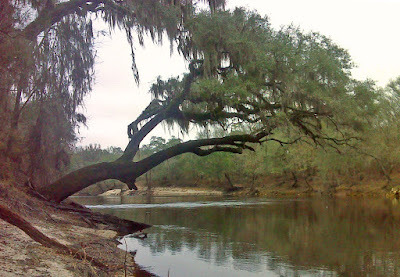 Today's hike followed the Alapaha River to its confluence with the Suwannee and then continued down the banks of the Suwannee. The highlights for me were the trees and their acts of defiance. Live oaks - Quercus virginiana, to be precise - support out-reaching branches like no other species. I think its their evolutionary niche - they reach out farther than their competition. They make their living by living on the edge - of rivers and sinkholes, for example. Other acts of defiance seen today included trees defying the seasonal cycle. Here's a red maple with green leaves in the heart of winter. It's been a warm fall, and most red maples are putting on their autumn display, as are the sweet gum trees. But it's not fall. It's nearly mid-January! Holey limestone, Batman! But back to the basic theme. I'm endlessly fascinated by cypress trees and their seeming defiance of the most basic rules of growth. Roots are supposed to grow down ... so what are the knees doing growing upward? Cypress knees not only defy the expectation for roots, the defy explanation itself. You've probably heard that they stick up out of the water in order to get oxygen, allowing the trees to grow in water. That's an urban legend. There is no scientific evidence for it. Scientists have cut all the knees off submerged trees and they continue to grow as well as trees with their knees intact. They've put enclosed air chambers around knees to see if they extract oxygen and found that they don't. The above photo of a cypress with a 'flying buttress' that has a knee offers the best clue at the true function of the knees. They work to help support the tree in soft soil. If the tree starts to lean, the 'urge' for the knees to grow strongly and precisely vertical causes them to add structure in the direction of the lean. Cypress knees are not defying gravity but exploiting it. POW! BAM! Bulls-eye, Batman. If you 'listen' to the trees, they will tell you their secrets. Below is a map showing today's route, with links to many more photos.